If you’re reading this, it’s a safe bet that the American Welding Society’s Certified Welding Inspector (CWI) program has impacted your career in one way or another. As welders, your handiwork has been inspected, and (hopefully) accepted, by a CWI on countless occasions. Some of you may have been mentored, or even introduced to the welding industry, by a CWI. After spending a solid amount of time behind a torch, most of you will decide, if you haven’t already, that you want to become a CWI yourself. In fact, I imagine a good chunk of you already took that step and made it happen. If that describes you: congratulations! In either case, you’re doubtlessly aware that being a CWI requires a remarkable amount of knowledge and experience. The challenging and comprehensive nature of the CWI exam reflects this. In order to have a better shot at making the cut, most CWI hopefuls opt to take part in a 5-day seminar that allows them to receive guidance and exam preparation from AWS-vetted instructors. And then there are those that want to stack the deck in their favor even more, by signing up for the CWI Pre-Seminar. For the uninitiated, the CWI Pre-Seminar is a collection of online courses that cover the fundamental welding concepts and principles that every CWI needs to know. 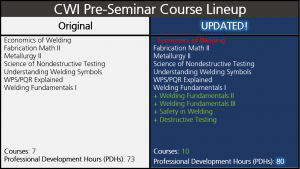 As its name implies, the Pre-Seminar is designed to bolster and solidify the knowledge base of prospective Welding Inspectors in preparation for the instructor-led seminar, and, ultimately, the CWI examination. Now, while it’s true that AWS Learning has offered the Pre-Seminar for quite some time, we recently made a pair of crucial tweaks that bear mentioning: the course lineup and the price. We’ll talk about the new price in just a little bit (spoiler alert: it’s cheaper! ), but we feel it’s especially important for you to understand the changes we made to the content of the Pre-Seminar, so we’ll cover that first. How Did the CWI Pre-Seminar Change? In order to recognize how something has changed, you need to be aware of how it was originally. Luckily, we’ve got a handy table that details the original and updated course lineups for the CWI Pre-Seminar. 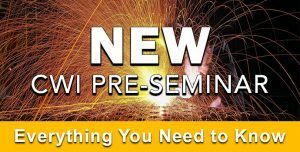 In short, the upgraded CWI Pre-Seminar features four additions: Welding Fundamentals II and III, Safety in Welding, and Destructive Testing, as well as one removal: Economics of Welding. Why Did AWS Learning Make These Changes? In comparing the contents of the Pre-Seminar with the Body of Knowledge for the CWI exam, we identified specific areas of study that could be integrated into the Pre-Seminar to flesh it out more fully. And in the interest of not making the Pre-Seminar too bloated, we removed the course that many respondents identified as having the weakest direct correlation with the CWI knowledge base. It just so happened that this course was also the longest and most in-depth of the bunch, allowing us to keep the overall length of the Pre-Seminar roughly the same. So, What Kind of New Information Is Now Included in the Pre-Seminar? Safety in Welding – As the old saying goes: Safety First! This course, created with ANSI Z49.1 in mind, covers workplace safety, material labeling and handling, personal protective equipment, general welding hazards, and hazards specific to arc welding, oxyfuel welding (OFW), and resistance welding (RW). Looking back, it’s a bit curious that this course wasn’t included in the Pre-Seminar from the get-go. Welding Fundamentals II – Welding Fundamentals II picks up where Welding Fundamentals I left off, focusing on the science, equipment, consumables, variables, safety precautions, and advantages and disadvantages inherent to each of the following processes: resistance welding (RW), plasma arc welding (PAW), electron beam welding (EBW), and laser beam welding (LBW), cutting, and drilling. Welding Fundamentals III – The third installment of the Welding Fundamentals series covers a pair of processes that are technically distinct from welding, but are no less important: brazing and soldering. Destructive Testing – The yin to Science of Nondestructive Testing’s yang. This course covers the various mechanical properties of metals, how these properties are evaluated, and how these evaluations are performed. How Else Can the CWI Pre-Seminar Help Me? You mean apart from strengthening your understanding of a wide range of welding topics? Well, completing the Pre-Seminar also grants you 80 Professional Development Hours, or PDHs. Taking the Pre-Seminar is a convenient way to accrue the hours of continuing education that you need if you’re already a CWI and need to recertify. Where Can I Find More Info About the Pre-Seminar Prior to Registering? That’s easy! For more details, check out the Frequently Asked Questions section of the Pre-Seminar main page. Or, if you’re ready to go right now, just head straight for the Pre-Seminar registration page. Hey, Hold On! Didn’t You Mention Something About a Price Change? That’s right! In the rarest of occurrences, you’ll be pleased to know that the price of something is going down for once! For a limited time, from May 21st to July 8th, we’re offering the CWI Pre-Seminar for $750! For comparison, the standard price of the CWI Pre-Seminar for AWS members is $865. If, for some strange reason, you aren’t a member then it would normally cost you $1150. Keep in mind, those prices are already about 40% lower than what it would cost if you decided to purchase each of the ten courses in the Pre-Seminar individually. If you’re still not sure if the CWI Pre-Seminar is for you, don’t sweat it. 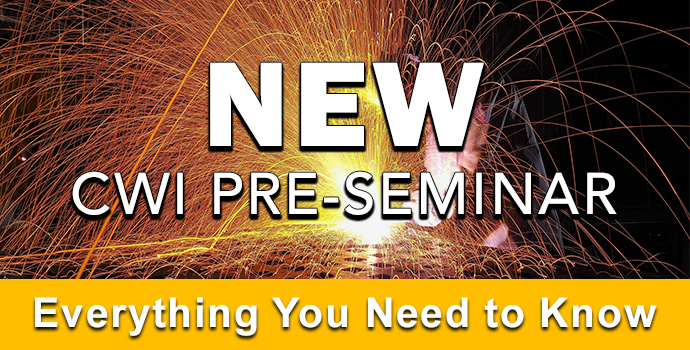 Over the next few weeks, we’ll be putting out a three-part blog series that will expound on the value of the Pre-Seminar for welding professionals at various stages of the CWI process. The first blog will focus on those taking the CWI exam for the first time. We call them “The Hopefuls”. The second one will concentrate on the benefits of the Pre-Seminar for “The Determined” – those who didn’t pass the exam on their first try, and are looking to dominate it the second time around. We’ll wrap up the series with a look at how the Pre-Seminar can benefit those we refer to as “The Accomplished”, who have already become CWIs. So, until then…stay tuned! If you have questions about any of the courses included as part of the Pre-Seminar, feel free to check out the AWS Learning main site. Or better yet, shoot us an e-mail or give us a call! Thanks so very much for the info. Yes I am very interested in becoming a CWI. Started learning to weld with my dad at eight years old. He sent me out in a rig when I was fourteen. Absolutely love it still but not gitting an younger. I am fifty now an really want to not only further my career an knowledge but also be able to pass that on in the field to younger up coming professional welders like myself. How do you go about becoming a member? Retired NCDOT Construction Inspector, presently employed by KCI as Senior Construction Inspector 4. Information on individual membership can be found here. Applying as quick and simple as well. Hope this helps some! Thank you for writing in! Unfortunately, we do not at this time. Should you have any additional questions, please feel free to contact us again! Yes I have been welding since January 24. 1977 I learned to welded at Newports News Ship yard &Dry dock co. Worked there until 1983 they started working at Surry Nuclear power plant and learned how to weld pipe and in have been weld pipe every since. I join the UA Steam fitters &Plumbers union in 1999 been working union every since.. I’m 60 years old and now want to have something to do part time after I retire. So becoming a CWI seems to be the thing to do.